About 100 museum specialists, all member of ICOM, met for a conference in the shadow of the Acropolis in Greece (11 -14 November 2015). 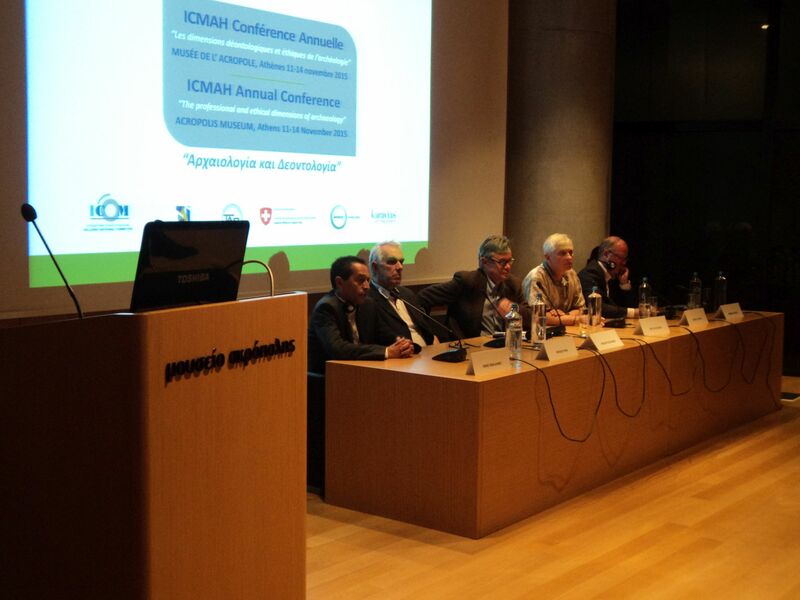 EXARC joined this conference and had several discussions with members of the board of ICMAH, the International Committee of Museums of Archaeology and History. This is one of the largest committees in ICOM. The very best of the almost 20 papers were given by France Desmarais (ICOM Paris, FR) on principles and dialogue when claiming cultural heritage and Markus Hilgert (Pergamonmuseum Berlijn, DE) on archaeological provenance research. Also the lectures by Mr. Mazarakis on “imagining the Balkans” and Mr. Sintès, public outreach in Arles, were very clarifying. Sessions included “archaeology, history and identity”, “public access and dissemination of knowledge”, ownership and claim of archaeological heritage” and finally “ethics of archaeological research”. Ethical rules are the cornerstones of a common frame of reference. The will to regulate is presently better than in the past. We want a professional museum sector based on best practice but there are too many different codes of ethics – the conference called for a new version of the ICOM Code of Ethics. The conference in Athens, too, was used to launch a proposal for a session in Milan under coordination of ICOM Netherlands, partnered by among others EXARC on archaeological landscapes and the role of museums in interpreting those, by example of the Roman Limes on the Lower Rhine in Germany and the Netherlands.